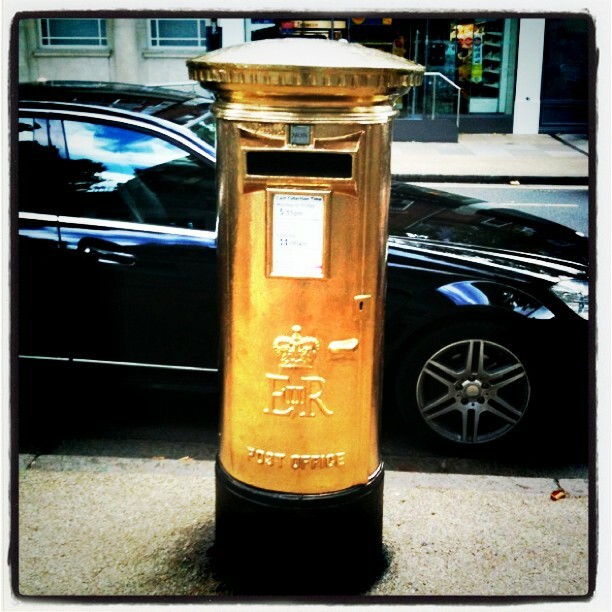 The post box in Kew is now gold – how, what, when, why? I spotted it today and can only find two other tweets about it. Is this post box with the Midas touch part of a quirky ad campaign? Has the Royal Mail changed its brand identity overnight? Is it an post-riot statement of defiance by the dinner party classes of Kew? Maybe it’s a publicity stunt? Could something viral about to take Surrey, or even the world, by storm, as in the recent ‘Greatest Marriage Proposal Ever’ which seems to have now disappeared completely (did she break off the engagement after all the silver screen activity proved too much?). Whatever the reason, it’s been beautifully done. So if anyone can shed light on why my local post box is disguised as an Oscar, please send your answers on a postcard disguised as an email to caroline@carolinegibson.co.uk. Written by Caroline Gibson, freelance copywriter, Kew resident and lover of quirkiness. This entry was posted in Copywriting tips, Life as a freelancer on August 16, 2011 by Caroline Gibson.